These companies should keep thriving for many years to come. A lot can change in 20 years. Some dominant companies will fade into the ether, and companies that don't yet exist will take their place. There are very few companies with competitive advantages durable enough to all but guarantee their continued success over the next two decades. According to three of our Motley Fool contributors, Waste Management (NYSE:WM), Berkshire Hathaway (NYSE:BRK-B), and Visa (NYSE:V) are members of that exclusive group. Here's why these stocks belong in your portfolio for the long haul. Tyler Crowe (Waste Management): A lot can happen in 20 years, but one thing is for certain: We're still going to be throwing away stuff. As long as we're creating rubbish, then Waste Management will still have a thriving business. This is a heavily regulated industry that makes it close to impossible for new companies to enter the fray, and waste collection and disposal is a low-margin business that benefits from economies of scale. As the nation's largest trash hauler, it is in a position to keep anyone from encroaching on its turf for many years to come. On top of having a business that looks to be incredibly durable, Waste Management also has a management team that you can trust to make good decisions and generate returns for investors. Even though it is a relatively slow-growth industry, management has been able to squeeze out profits by being hyper-focused on costs and by increasing per-share profits with a hefty dose of share repurchases. As a result, this seemingly boring business is cranking out strong returns on equity on a regular basis. The combination of an incredibly durable business in an unpopular but necessary industry and a management team that has a reputation for being good stewards of shareholder capital are what I want in my multi-decade investments. That's why I own shares of Waste Management and am completely comfortable owning them for the next 20 years or more. Tim Green (Berkshire Hathaway): Warren Buffett has built Berkshire Hathaway into a $500 billion behemoth over the past half-century. The conglomerate consists of a diversified set of wholly owned businesses, including insurance operations, a major railroad, and dozens of other companies, as well as a massive portfolio of stocks. Even though Berkshire is valued at over half a trillion dollars, Buffett thinks it's cheap. 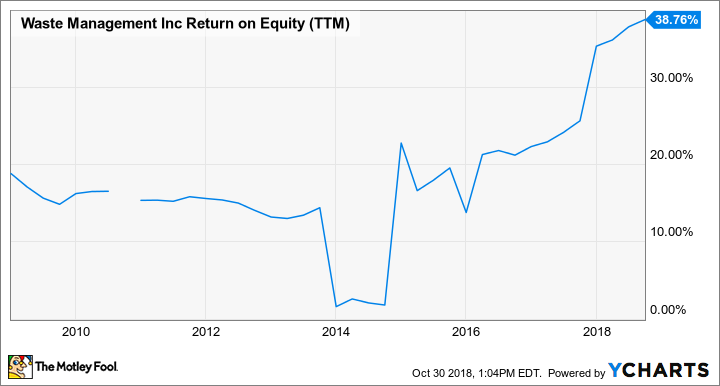 The company bought back around $1 billion of its own shares in August, and more buybacks could be coming as Berkshire's cash pile grows and a lack of reasonably priced acquisition targets persists. Buffett's aversion to overpaying for companies is one reason Berkshire has thrived over the past 50 years. "Be fearful when others are greedy, and greedy when others are fearful" is a Buffett mantra that has served the company well. Buffett won't be in charge forever -- the iconic investor is now 88 years old. But as long as his successors stick to the conservative, value-based approach that Buffett is known for, Berkshire can continue to thrive for decades to come. Sean Williams (Visa): There aren't too many stocks that have set-it-and-forget-it appeal for two full decades, but payment processing facilitator Visa is one of those rarities. Within the U.S., Visa possesses an almost insurmountable payment processing market share. Between 2006 and 2016, Visa's U.S. market share by network purchase volume grew from 42.5% to 50.6%. Meanwhile, the next closest competitor, American Express (NYSE:AXP), was nearly 28 full percentage points behind, as of 2016. Having such a huge lead in the most important market in the world makes Visa a go-to partner for merchants, and it should lead to steady long-term growth. Visa also offers plenty of potential beyond the confines of the United States. In June 2016, it acquired Visa Europe, which substantially boosted the company's merchant count and worldwide card circulation reach. Just as important, it gave Visa access to a handful of faster-growing Eastern European countries. In terms of sheer market potential, roughly 85% of global transactions are still conducted in cash. This should allow Visa to significantly expand its presence in Africa, the Middle East, and Southeastern Asia over the next couple of decades. These emerging market regions offer substantially higher growth rates and help make Visa nearly recession-resistant. As the icing on the cake, Visa has delivered a steady uptick in its dividend that's been commensurate with its growing business. Although it's yielding only 0.7%, I wouldn't be too concerned. Visa is busy reinvesting in the infrastructure that'll drive its foreign and domestic growth, yet it still has ample cash to pass along a modestly improved payout every year since 2009. Long story short: Set Visa and forget it.